You don’t take my breath away. 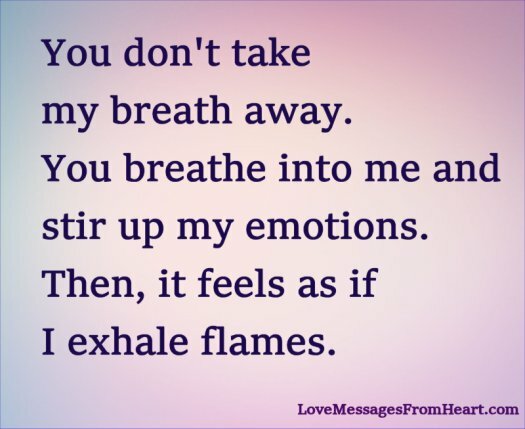 You breathe into me and stir up my emotions. Then, it feels as if I exhale flames. A simple smile from you, a simple touch from you can flame up my emotions and make my heart beat faster. I long for every whisper of your breath, for every smile of your heart, for every wink of your soul. You evoke happy emotions in me, you surface the most beautiful feelings in me – the ones I have kept hidden for too long. My dear, you are the reason I have such beautiful emotions inside me, such peaceful serenity and such memorable loving feelings. I am happy with these messages. Thank you. Very nice messages. You can use it for text messages to ones you love.